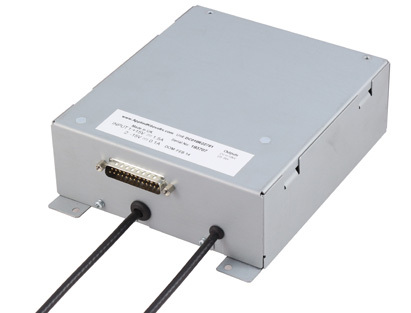 This range of high performance high voltage power supplies has been specifically designed for mass spectrometer multi-stage detector applications requiring a fast polarity switching conversion dynode and fast settling electron multiplier output. The DC series complements our range of fast polarity switching source (SC series) power supplies and the use of Dynamic Control TM technology within the output stages ensures fast and accurate settling after polarity change with minimal overshoot. For custom / volume applications please contact us for details. +24V dc ±10% <1A. 0V input common to HV return and chassis. 0 to ±5V for 0 to 100% rated output voltage, input Z = 1M, polarity follows the control polarity. 0 to +5V for 0 to 100% rated output voltage, input Z = 1M. All outputs are protected against intermittent arcing and continued short circuit to ground. Up to ±15kV / *Reversible, maximum 1kV / mS with settling to 90% of target, this can be limited to a slower speed if required (up to ±10kV is available in the smaller package size). Up to 10kV / Fixed, “N” denotes negative and “P” denotes positive (position “Y” in part number), maximum 1kV / mS with settling to 90% of target, this can be limited to a slower speed if required. <0.1% for 10% change in input voltage. <0.1% for 20% to maximum load. <0.01% per hour, <0.05 over an 8 hour period.